2014 is already turning out to be a record breaking year. On a less promising note, I’ve managed to dns 50% of entered rides. Last Wednesday was one of those rare forays into the outer world of tarmac, puddles and real roads (well, some were roads, but are increasingly starting to resemble lumpy farmyard tracks). The weather forecast at BBC and Metcheck, both promised 0.0mm of rain for that day. The weather looked so good, I cancelled an economics lesson (easy in half-term week) and planned a good long five hour ride in the hills of the Chilterns. With the good weather forecast, I took my time trial bike. When you get used to spinning away on the rollers or flying on your TT bike, it’s a bit of comedown to go back to winter training hack. I did 40 miles on Monday, in a record low average speed of about 13.8mph. I didn’t want to repeat that. Alas, the weather forecast proved to be misleading. Almost as soon as I had got spitting distance from Oxford, the weather gods began having a laugh, and started spitting at me. It was never heavy rain, just that fine drizzle that soaks you through. I think fine drizzle is better English phrase than ‘it’s spitting’ – but I heard it a lot when growing up in Yorkshire and Lancashire. I persisted for a good four hours, and was quite pleased to get some hard miles in. It was made more difficult because I tilted my tribars upwards – this is more aerodynamic, but much more awkward and painful, I’m being to question whether the aero gains suggested by the wind tunnel are worth the extra effort and pain in the arms and shoulders. Not for a 12 hour, that’s for sure. I did several hill efforts. A five minute power effort suggested I’d gained 20 watts in two weeks Yah!. From a very low base, but at least at this time of the year, you can see easy gains for relatively little effort. It’s like the first season you take up cycling and make huge gains. Only to find it gets increasingly difficult to keep increasing power as time progresses. It was quite a good two weeks training, so five days off is not the end of the world. But, it would be nice to starting breaking records which don’t involve cycling under a deluge of rain and water. By the way, Ashrita Furman of cycling underwater fame, has one of the few Sri Chinmoy Cycling Team records, that I don’t have. He did a very credible 405 miles for 24 hours back in the 1970s. It’s one record I won’t be attempting for quite a while. 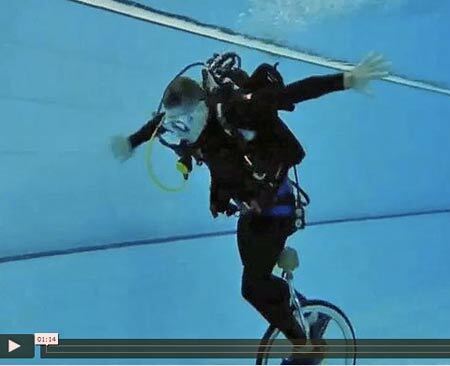 And as for the long distance underwater unicycling…..